Definition at line 32 of file CQRDFTreeView.h. Definition at line 36 of file CQRDFTreeView.cpp. Definition at line 44 of file CQRDFTreeView.cpp. Definition at line 165 of file CQRDFTreeView.cpp. References mNode2Item, mpGraph, and pdelete. Referenced by enterProtected(), and ~CQRDFTreeView(). Definition at line 56 of file CQRDFTreeView.cpp. References CRDFSubject::BLANK_NODE, clear(), CCopasiMessage::clearDeque(), COL_SUBJECT, CRDFGraph::createAboutNode(), find(), FROM_UTF8, CKeyFactory::get(), CCopasiMessage::getAllMessageText(), CRDFSubject::getBlankNodeID(), CCopasiRootContainer::getKeyFactory(), CAnnotation::getMiriamAnnotation(), CRDFSubject::getResource(), CRDFGraph::getTriplets(), CRDFSubject::getType(), CRDFParser::graphFromXml(), insert(), CopasiWidget::mKey, mpGraph, CRDFSubject::RESOURCE, CQRDFTreeViewItem::setTriplet(), CCopasiMessage::size(), and CQMessageBox::warning(). 95 // We make sure that we always have an about node. Returns the list view item for node if it exists otherwise NULL. Definition at line 172 of file CQRDFTreeView.cpp. 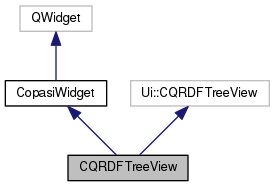 Definition at line 182 of file CQRDFTreeView.cpp. Definition at line 49 of file CQRDFTreeView.cpp. 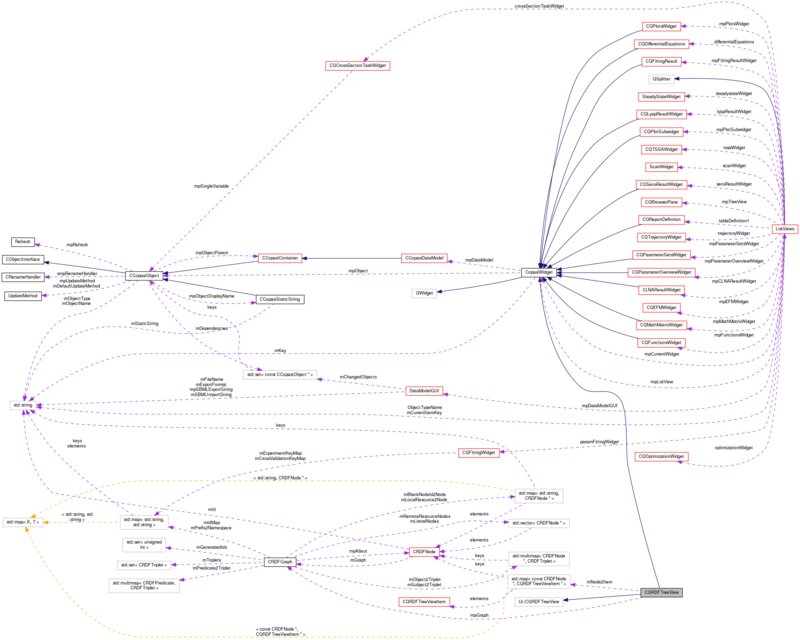 A map to look up items associated with a node. Definition at line 72 of file CQRDFTreeView.h. Referenced by clear(), find(), and insert(). Definition at line 77 of file CQRDFTreeView.h. Referenced by clear(), and enterProtected().